With good ingredients, this is an impressive dessert. It’s also one of the simplest recipes in the book. You really can throw it together in a couple of minutes. I ordered some strawberries from Riverford in this week’s veg box. I wasn’t sure at the time what I was going to do with them, but I thought I’d probably be able to find something tasty. This is what I settled on. 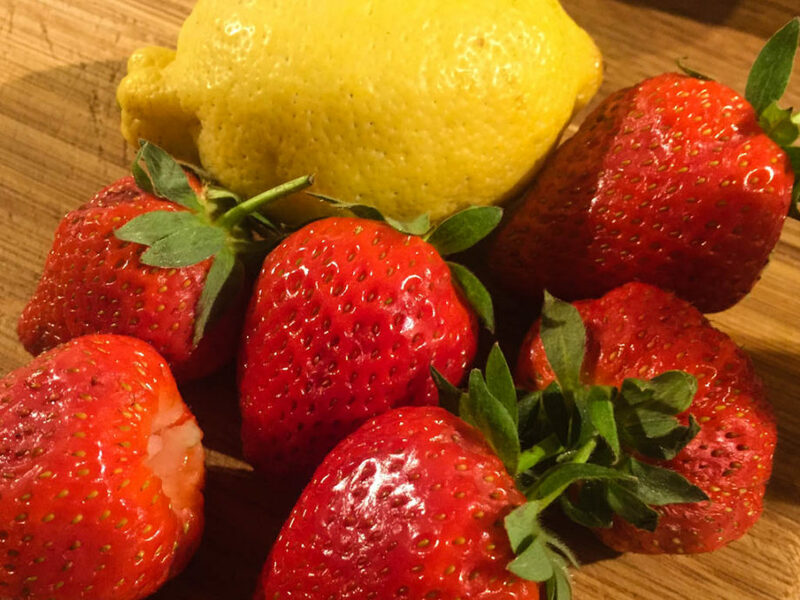 A key thing is to remember to use good, flavourful strawberries, and remember to take them out of the fridge an hour or two before eating – you want them at room temperature rather than fridge-cold here. Hull the strawberries and cut into quarters. Place in the base of some ramekins. Take some lemon zest and cut it into fine strips. 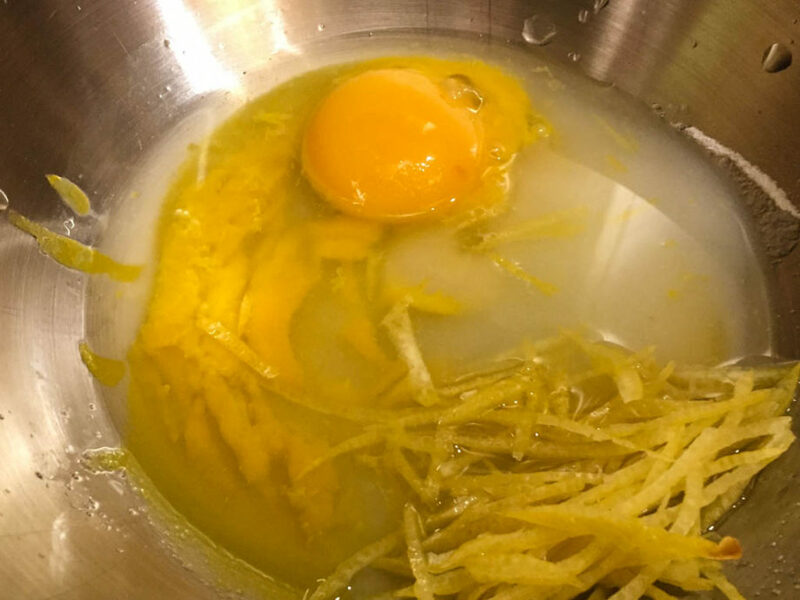 In a steel bowl, mix some egg yolks, sugar, grappa, white wine and the lemon zest. 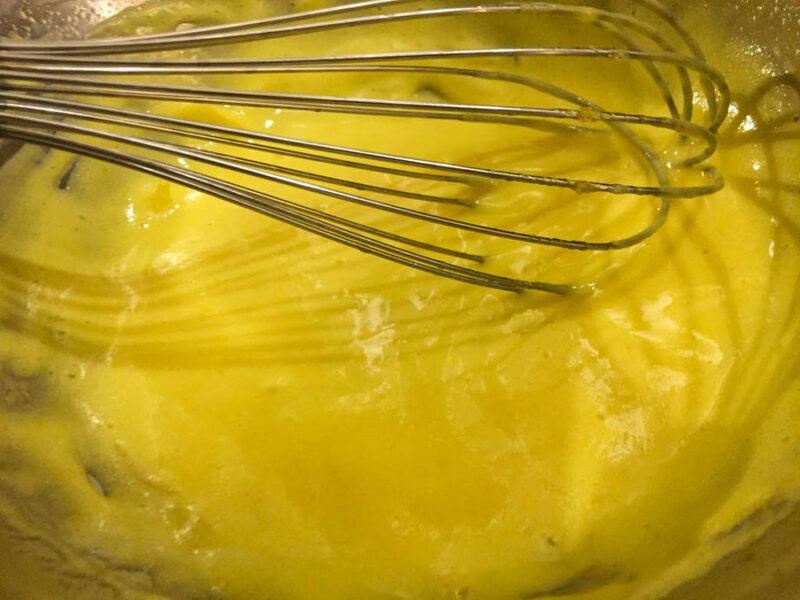 Whisk over a pan of gently simmering water for a couple of minutes until it’s light and fluffy. 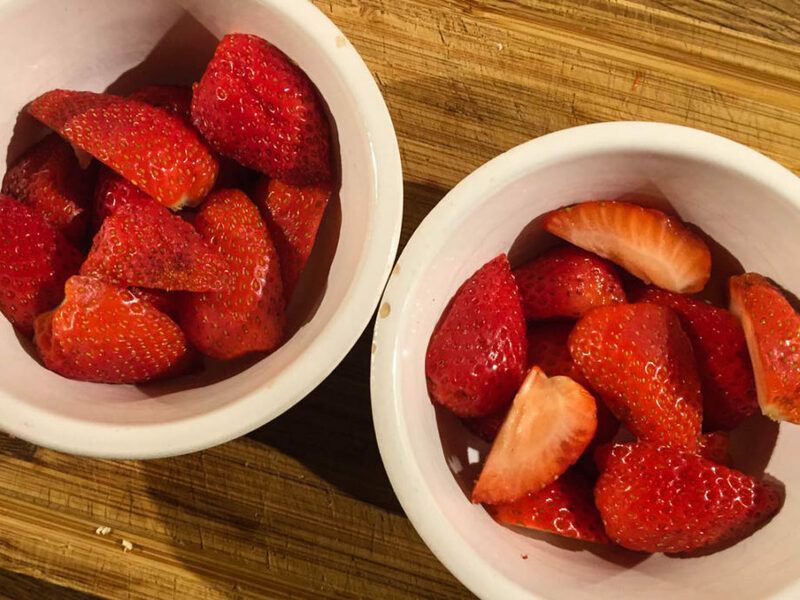 Pour over the strawberries, sprinkle with a little icing sugar, and lightly sear with a torch (or under a hot grill). Utterly delicious. Light, lemony, sweet and boozy, all at once. A great way to finish dinner. 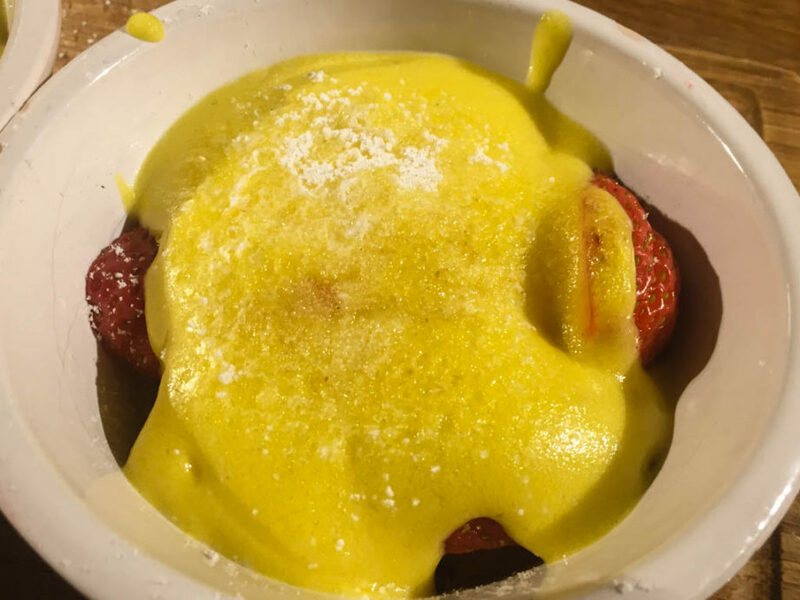 We had some lovely, proper strawberries in the organic veg box this week and so Dave decided it was time to make this delightful, light, summer pudding with them. And they were a good choice. This dessert would have been nothing much at all if the strawberries were the usual shop bought, rock hard, tasteless pap we get here in the UK most of the time. As it was, they were full of flavour and so the desert was a delight. Sweetness of the strawberries counter balanced with the sharpness of lemon jest and the nice kick from the grappa, which tasted like brandy in this dish. 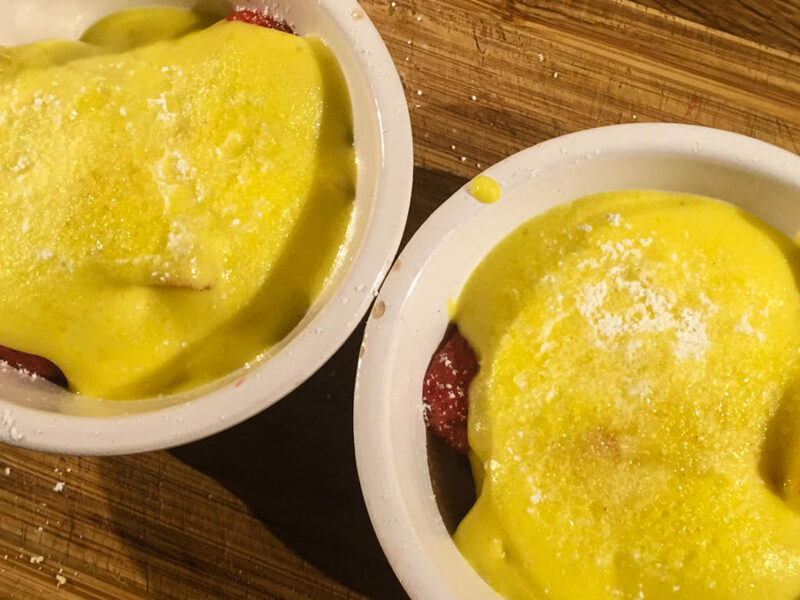 The custard was a very simple dairy-free egg custard and Dave sprinkled a layer of icing sugar over the top and gave it a quick blast under his hand-held grill thing. The result was a delicate brûlée topping which just cracked gently under the spoon. This was a very nice summer evening desert. Would work well with a glass of chilled white wine. That looks like an excellent dessert for a cold winter’s evening in my castle. Well Done Dopiaza, 10/10 Greene Points! Mmmmm. I’ll be making this then. Dave – if I haven’t got Grappa (even though there is one called Grappa Julia) what could I substitute? Hoping you don’t suggest meths. Duck a l’orange looked heavenly last week by the way. Grappa’s really just a clear brandy, so I imagine substituting regular brandy would be just fine. The end result might be slightly darker in colour, but I’m sure it would taste pretty much the same. Excellent and considered response Dave! Have lots of brandy!